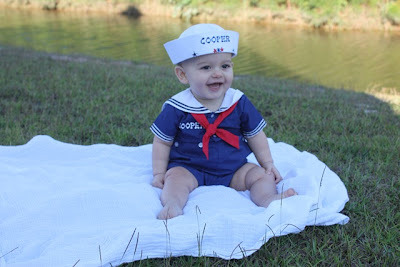 Nautical by Nature: Nautical Outfit of the Week: Sailor Cooper! I knew I had to feature this photo as soon as I saw it! Cooper is the son of Andrea from My Chihuahua Bites. Isn't Cooper the cutest??? The sailor suit is by Petit Ami. aww look! Coops is a model! OH! Toooo cute for words!! Cooper is precious!! Thank you for sharing this adorable picture.